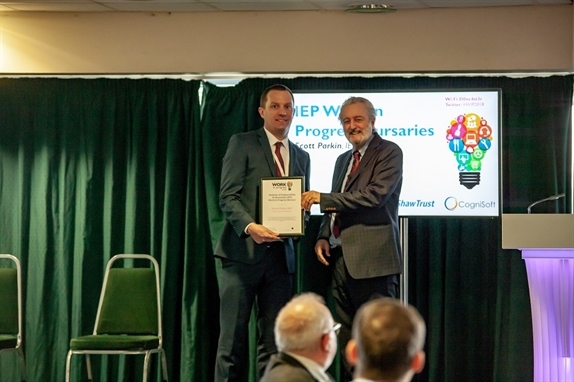 The IEP were delighted to attend Doncaster Racecourse for the annual Work in Progress conference on 25th April, which was sponsored by Shaw Trust, Cognisoft and Iconi Software. Together with organisers and IEP Corporate Affiliate Partners Carley ConsuIt, we presented an Award Certificate to this year’s Bursary Winner, Richard Philips from Breakthrough UK who support disabled people to work and live independently. Speaking about the conference, Richard (pictured above) said “Both key note speakers were excellent, Paul Lewis in particular delivering some very interesting insights into personal income for low income families, the benefits system and DWP contracts. “The Mini-Master class around Mental Health Awareness from Steps to Work was of great use – nice to hear about how much a company from CEO downwards recognises the importance of good mental health in the workplace and is actively seeking to educate other senior leaders. The delivery of a practical session from Doncaster College gave an opportunity to see and hear how well their hair and beauty team value work linking directly into employment. In one of the talking table sessions about Motivating Disadvantaged Groups in to Work, I was about to offer my own input into a lively discussion on something that is from my own area of expertise. IEP Chairman Scott Parkin FIEP said “We were really pleased to welcome Richard to this year’s event and hope his positive experience will highlight the benefits of taking up bursary offers as an opportunity to network, gain new insights and practical advice. We are grateful to our partners Carley Consult for providing this opportunity and making it a reality”.